Last week I went over to Seattle Tuesday night for a blogger meetup (more on that tomorrow) and left the boys with my parents for the evening. Then I spent the next 2 days with them just hanging out (and being the resident computer instructor!). The boys really wanted to go swimming. Well, Cory did, Noah didn't really know what it was! Finally on the last day it was almost warm enough to go. 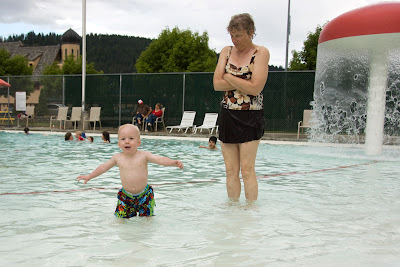 Noah was a little freaked out to begin with and clung to me like he did at the YMCA pool a few weeks ago. But I sat down in the shallow water with him in my lap where his feet could touch the bottom. In just a few minutes he stood up and started walking around and then "diving" into the water like he does in the bath. From there on he was fearless. He does this army crawl thing in the water and was heading out into the deeper water. You can see the red line on the bottom of the pool and beyond that it was too deep for him to crawl, but he didn't seem to care and just kept going. We had to keep a close eye on him so he didn't crawl off into too deep water and drown himself! Even though his little lips were quivering and purple by the time we got out he did NOT want to leave! To add insult to injury then we had to take cold showers! 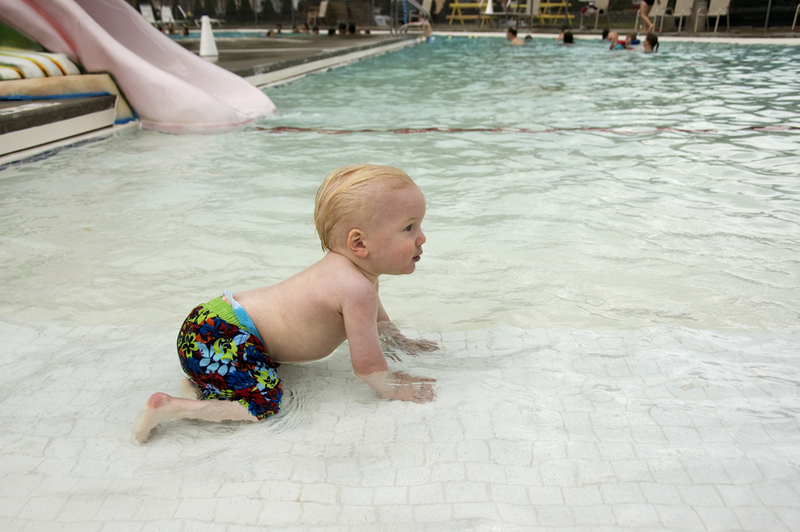 We'll be back when it's warmer, this is a great pool for the littles! Glad he liked the water! Looks like he had a lot of fun!